Just popping on with a quick post today. I’m getting prepped to start blocking at today’s rehearsal for the High School play I’m directing. The most tedious part of directing – figuring out who moves where, when and why. At least today’s card wasn’t tedious to make, even though I made 20 of them for a recent swap. I really love the delicate feel of this one. I used the Perennial Birthday set. Colors are Rose Red, Soft Sky, Peekaboo Peach, Pear Pizzazz and Crumb Cake. The Soft Sky card base has been embossed with the Simple Stripes Textured Impressions embossing folder. The sentiment is embossed in white on a strip of Wood Textures designer series paper. This is hands down my favorite designer series pack. I LOVE the various wood textures/ grains. They are a great addition to many projects. A few rhinestones and a small linen thread bow add the finishing details. I love this pineapple print from the Tutti-frutti designer series paper stack. I used the pineapple from the Itty Bitty Fruit punch pack to punch out tiny pineapples from the patterned paper. I stamped the bowl from the Fruit Basket stamp set on Pool Party card stock and fussy cut it out. To add a little detail, I added some shadows with the light Pool Party Stampin’ Blends marker. Here is a close up so you can see it better. I think it added some nice depth to the bowl. And, aren’t those little pineapples adorable? I LOVE that little punch. The whole Tutti-frutti suite in the Occasions catalog is fun. I can’t wait to play with it some more. I have lots of ideas floating around in my head, just need time in my studio! Happy Valentine’s Day. Thought I would pop on and share one more card I made with the Sure Do Love You set and Painted with Love DSP. This picture really doesn’t do it justice. The dark spots are actually the gold foil on the DSP. I just couldn’t get it to photograph well. The vine heart is embossed in gold and fussy cut out. I kept the rest pretty simple to let that gorgeous specialty paper take center stage. I seriously want to just frame a few of the pieces. They are works of art all on their own! I normally don’t make a lot of Valentine cards. One for my husband and maybe little notes for my kids. But, I am having so much fun with the Painted With Love Suite. There are so many fun products to work with. I made three little coordinating love notes with this suite. They are made with the Narrow Note Cards and Envelopes in the Occasions Catalog (page 19 – they are easy to miss). The Painted With Love Specialty DSP is SO GORGEOUS!! The gold foil accents are stunning. The Sure Do Love You stamp set and Lots to Love Box Framelits combine to make some wonderful Valentines. These little love notes would be perfect to tuck in with a Valentine treat. Aren’t these so cute! Each one features a different pattern from the DSP and different stamps from the set. Let’s take a closer look at them. Here is another angle so you can see the little heart peeking through from the inside. I added some of the DSP to the flap of two of the envelopes and sponged ink and stamped a little heart on the other. It really ties them together. Another fun thing is that these notes would fit inside this little box I shared last week! Hello! Just a quick post today. I finished auditions for the High School spring play I’m directing and am in the middle of casting the show. How about a quick Valentine project today? I made a quick little treat box with the Lots of Love Box Framelits Dies. I just love the possibilities with this box die, beyond Valentine projects. The box is cut out from the Painted With Love Specialty Designer Series Paper. Love the gold foil on this paper. I heat embossed the heart vine and the banner in gold and splattered Calypso Coral and Melon Mambo ink. Next I stamped a Calypso Coral heart as well as the little Melon Mambo Heart and die cut them. I also cut one of the little hearts out of Melon Mambo card stock for layering. A few rhinestones finish off a fun little treat for your Valentine. Well, tonight is the final dress rehearsal for our Middle School production of Mulan Jr. Followed by a performance for 5th and 6th grades Thursday morning and three public shows Friday through Sunday and it’s a wrap. Then I move right into auditions for our High School spring play. Whew. Thankfully I have some projects finished ahead of time that I can share with you. Like this one. Today’s card features some fun products. The Amazing You stamp set and coordinating Celebrate You Thinlit dies available in the Sale-A-Bration Brochure; Shimmery White Embossing Paste in the Occasions catalog; Copper Metallic Thread, Copper Foil Sheets, Wood Textures and Fresh Florals designer series papers, and the Pattern Party Decorative Mask in the Annual Catalog. The Embossing Paste adds some great texture to the card. It is very glittery, the photo doesn’t do it justice. The flower image is stamped in Early Espresso Ink on the Wood Texture dsp. The hint of Powder Pink dsp is a supports the copper sentiment nicely. I had some fun playing along with another challenge at Fab Friday. This time it is a sketch challenge. 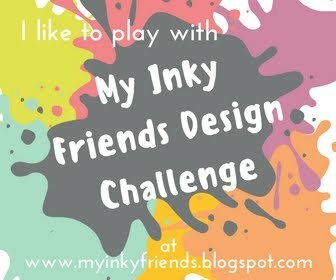 Go check it out and play along! I was inspired to use the Bubble Over set. I have been having a lot of fun with this one lately. I stayed pretty true to the sketch with my card, but decided to expand the focal shape. I am in love with the Bubbles and Fizz dsp in the Sale-A-Bration brochure. These colors are so bright and fun. Started with one of the Tutti-frutti cards also from the Sale-A-Bration brochure. Layered the bottle print strip and the this strips (the thin coral strip is from one of the Tutti-frutti cards, too). I die cut the bottle out from one of the sheets of dsp and layered it on a Starburst punched from another pattern in the pack. Added the banner with the sentiment and finished off with some of the enamel dots. Monday we had an early school dismissal due to bad weather. This meant our rehearsal for the Middle School musical was cancelled. (Sigh) We really can’t afford to lose a rehearsal at this point, so we will make it up on Friday evening. Yuck. I really don’t like Friday rehearsals. But, it is what it is. The show must go on. So, how about a hint of summertime for today’s project? – A fun little Pineapple treat box. I used the Sale-A-Bration Tutti-Frutti cards for the box. I started with the card base. Since it is already scored , I trimmed 1/4″ of one side. Giving me a 8 1/4″x5 1/2″ base. Next I scored every 2″ along the 8 1/2″ side. Turned and scored up 2″ o the 5 1/2″ side. Next cut the bottom tabs so the box will fold together and trim off the extra 1/4″ piece on the bottom. Hopefully the photo below helps my explanation. Assemble the box and pinch the top together. I cut the green top by hand and glued it inside the top before closing it up. I punched out notches on each side with a 1/4″ hand held punch and wrapped Linen Thread around to hold the box shut. The little tag features the Tutti-frutti designer series paper and the Fruit Basket set and matching punches. I just love that tiny little pineapple! A fun summertime treat in the midst of winter. I’m back with another Bubble Over card. This set and paper are just so much fun to create with! The paper has so many fun patterns in it. I really like how the Basic Gray card base lets the colors pop. I die cut the bottles from one of the sheets of Designer Series Paper, easy peasy. I altered the label on the light green bottle by punching out circles form other bottles on the sheet to create the label I wanted. The sentiment is actually in 2 long lines, so I did a bit of masking to make it fit the space. It is embossed in white to help it stand out. A die cut bottle cap and some Clear Epoxy drops add the finishing details.